A showpiece created entirely from sugar is truly a work of art, and it takes an eye for design and strong pastry skills to work with this delicate medium. The Art of the Confectioner is the ultimate guide to working with sugar to create beautiful sugar and pastillage shapes, flowers, figurines, and breathtaking full-scale showpieces. 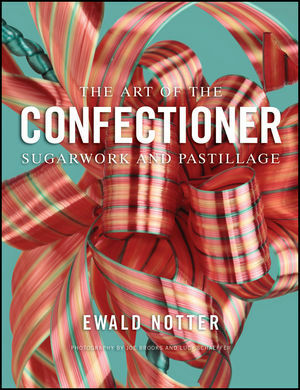 Author and award-winning pastry chef Ewald Notter shares wisdom gained from more than 35 years in the pastry kitchen, and combines straightforward advice and step-by-step instructions with lessons on developing artistry and design skills. The book begins with a basic overview of sugar, including information on the equipment and ingredients needed to work with sugar and Isomalt. Subsequent chapters cover Pastillage, Sugar Casting, Sugar Pulling, Sugar Blowing, and New Trends in Sugarwork, and include detailed instructions on how to make everything from delicate flowers to whimsical blown sugar figurines. And the final chapter shows how readers can bring together all the skills learned throughout the book to create award-winning sugar and pastillage showpieces. From working with shapes and color and choosing a focus point to developing a sculpture based on a particular theme, Notter provides insights into all the tricks of the trade and expert advice on preparing for competitions. Throughout the book, techniques are explained with simple, step-by-step instructions and illustrated with clear how-to photos, while stunning showpiece beauty shots provide inspiration. The book includes hundreds of color photos as well as beautiful hand-painted watercolor illustrations by the author, and an Appendix of templates is provided to help readers replicate the showpieces shown throughout the book. For pastry students, aspiring confectioners, and professional pastry chefs looking to improve their skills for restaurant work or competition, The Art of the Confectioner is a must-have guide from one of the field's most well-known experts. Ewald Notter is the founder and owner of the Notter School of Pastry Arts in Orlando, Florida. Renowned as a master of sugar and chocolate work, he was the first pastry professional inducted into the Pastry Art and Design Hall of Fame. He has won numerous awards, including National and World Pastry Team Champion and Pastry Chef of the Year. In 2001, he won the gold medal with the U.S. Team at the Coupe du Monde de la Pátisserie in Lyon, France, with the highest score ever recorded in sugarwork. He has taught at pastry schools around the world and served as a pastry advisor to the American Culinary Federation's Culinary Team USA.